Sui Jianguo presents a solo exhibition of sculpture and paper-based works at Pace Gallery, Hong Kong. The exhibition is the artist’s first in Hong Kong in nine years, and features new works from 2017 alongside his 1992 sculpture Earth Force. Currently head of Sculpture at Department of Sculpture in Central Academy of Fine Arts in Beijing, Sui Jianguo is credited with expanding the possibilities of contemporary sculptural work with materials and of contemporary Chinese sculpture. He often works with hard, heavy, industrial materials such as steel and concrete; through his struggle with the materials he represents social and internal struggles, as well as making deft visual comments on Chinese culture from the Mao era onwards. Earth Force features a series of boulders made from stone boulders enclosed in webs of steel. The particular rigidities of metal and stone, and the tensions between the materials, become interlocked permanently into the artwork.Earth Force took two years to produce and is an iconic and influential piece of contemporary Chinese sculpture. 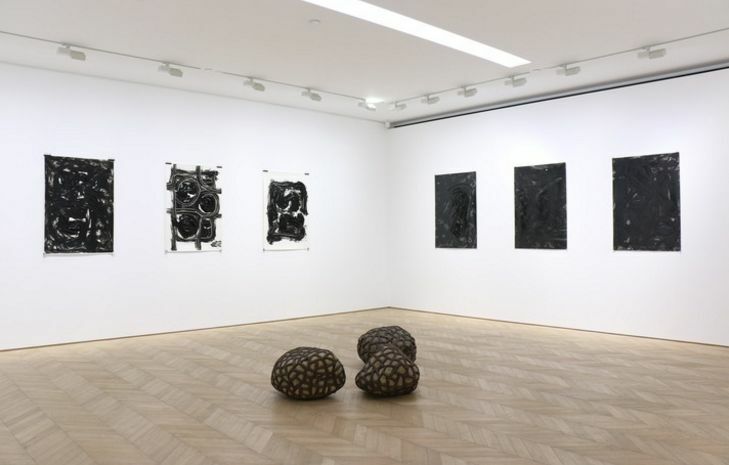 The work is presented alongside a series of new ‘paintings’ on paper, which are the result of Sui Jianguo’s recent focus on the relationship between material and the representation of cognitive and spiritual conflicts. The paper works use light materials minimally and are completed rapidly and dynamically. The movement in these works creates a tension with the weight of Earth Force, while there is also an interesting contrast between the focus on surface marking in the newer works and the semiotic properties of industrial materials in Earth Force. The exhibition in its entirely constitutes a multi layered exploration of the relationship between materials and human perception and identity. Sui Jianguo is on at Pace Gallery Hong Kong located at 15C Entertainment Building, 30 Queens Road Central, Hong Kong from 7 July to 24 August 2017.